five lucky sweepstakes entrants can win Free Ruby Tuesday for a Year. for instructions, restrictions and prize information. for only $3.99 or substituted as a side starting at $1.49. fruit mingled with vanilla, mocha and toasty oak notes. cards, which are redeemable March 1 through April 11.
items – including the new, improved Garden Bar – visit RubyTuesday.com. or garden bar entrée on your birthday (up to $11 value). Ruby Tuesday, Inc. owns and franchises Ruby Tuesday brand restaurants. restaurants, comprised of 18 domestic and 49 international restaurants. about Ruby Tuesday, please visit www.rubytuesday.com. 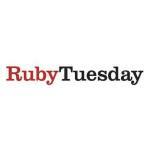 Ruby Tuesday, Inc. is traded on the New York Stock Exchange (Symbol: RT).